Using omics techniques to provide comprehensive molecular analysis in an unbiased fashion is a hot topic in medicine. Approaches include genomics (DNA), transcriptomics (RNA), proteomics (proteins), and metabolomics (metabolites). In a recent Perspective published in AJKD, Eugene Rhee shares how nephrology is a fertile ground for such research. Genome-wide association (GWAS): where hundreds of thousands of single-nucleotide polymorphisms (SNPs), generally in thousands of patients, may identify markers associated with a trait of interest, eGFR for example (see NephMadness 2015 for more). Genome-wide techniques led to the discovery of APOL1 risk polymorphisms being strongly linked to kidney disease in people of West African origin. Next-generation sequencing (NGS), which includes panels of genes (eg all genes known to cause steroid resistant nephrotic syndrome), whole exomes (all coding portion of genes) or genomes (entire DNA; see NephMadness 2015 for more). These methods have discovered many new genes for glomerular and tubular nephropathies as well as congenital abnormalities of the kidney and ureteric tract (CAKUT; see NephMadness 2018). 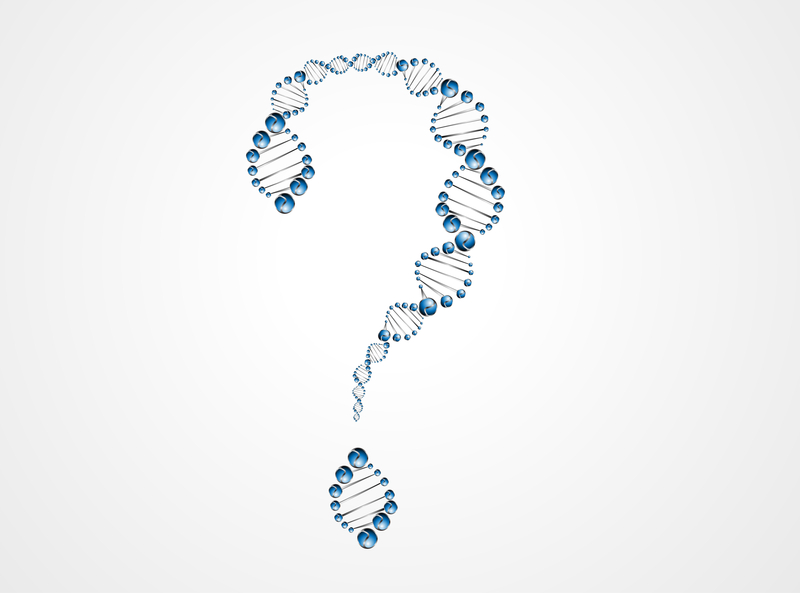 As well as analysing genes, NGS approaches can examine all transcribed RNA (RNA-seq) which may include messenger RNA (protein coding) as well as non-coding RNA such as microRNAs which have epigenetic roles in modifying gene expression. These approaches have been used to complement allograft histology, providing a molecular diagnosis and bringing clarity to traditional patterns of injury on biopsy. These techniques have been incorporated in the recent Banff update (see NephMadness 2016 for more). Rhee discusses some important considerations when using these techniques, such as the large amount of data generated, the need for robust bioinformatical approaches to interrogate these data, and strategies to account for erroneous results and correct for multiple testing. It is also important to consider how to approach variants of unknown significance and incidental findings. While the volume of research generated in metabolomics (and proteomics) pales in comparison to genomics, uremia would seem an ideal milieu for this type of work. Many novel uremic solutes have been discovered using modern techniques and may shed light on interactions of the genome with the environment, the epigenome, and the microbiome in kidney failure. Moreover, it is hoped that discovering new biomarkers will allow earlier detection of organ dysfunction. 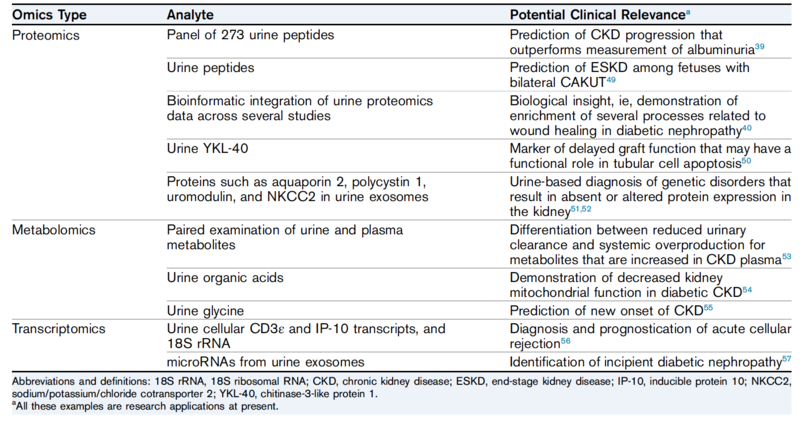 Urinary peptides, metabolites, and RNA could theoretically facilitate diagnosis and prognosis in kidney disease. Representative Omics Studies of Urine in Kidney Disease. Table 2 from Rhee, AJKD © National Kidney Foundation. While much of the Perspective focuses on the potential of these techniques to change care, there are real-time examples of omics breaking into the clinic. As mentioned, NGS is revolutionizing molecular diagnosis for familial kidney disease and the molecular microscope is becoming available to aid conventional histology, at least in transplantation. Kidney biopsy interpretation can also be enriched with omic analysis performed on whole tissue extracts to look at gene expression. With laser microdissection and the ability to separate specific compartments of the tissue, proteomic analysis can be used on glomerular deposits in a wide range of diseases (fibrillary glomerulonephritis, amyloidosis, immunotactoid glomerulopathy, lupus, etc). Overall, this is a useful and succinct review for the general nephrologist wishing to keep abreast of these modern techniques. Omic technology supplements our existing knowledge and hopefully will translate into unique diagnostic and therapeutic options for our patients. – Post prepared by Paul Phelan, AJKDBlog Contributor. Follow him @paulphel. To view the Rhee Perspective (subscription required), please visit AJKD.org.